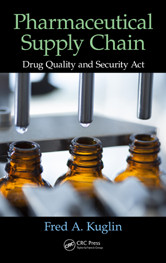 Pharmaceutical Supply Chain: Drug Quality and Security Act overviews the new mandate and its implications, including implementation strategies for track-and-trace programs along with presenting a fuller understanding of the mechanics of intergovernmental policies and oversights. The book focuses on the delicate balance between protecting the public through legislation against negligent compounding pharmacies and protecting patients by assuring a supply of needed compounded drugs by not over-regulating the industry. How Did We Get to November 27, 2013? Once Again, What Just Happened—and How Did We Get to the Drug Quality and Security Act? Why the History Perspective of the Big Three? Why Do Internet Pharmacies Exist? Why Do Reverse Distributors Exist? What Are the Critical Inhibitors?